This being the day of a Royal wedding, I can reflect on Wolverton’s long association with coach building for the Royal Family. 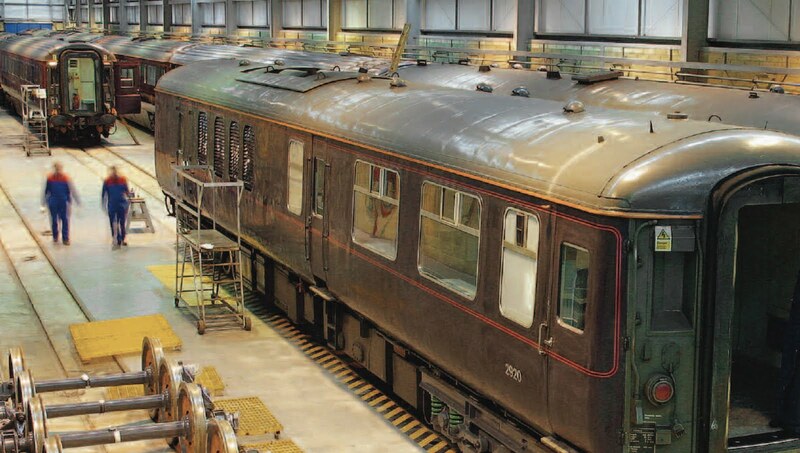 In the building of coaches of the highest quality Wolverton was pre-eminent and the workmen were able to meet the exacting standards expected for the monarch. Coaches were built there for Royal use from the 1840s but the 1869 saloons built for Queen Victoria set new standards. Carriages were limited in length because of the need to negotiate curves on the track safely, but the royal entourage demanded more space than could be satisfactorily squeezed into a single carriage. Victoria, however, was very nervous about stepping from one carriage to the next, so the Wolverton engineers came up with the idea of a bellows unit that could connect two carriages without exposing passengers to the elements. Before long this feature became standard on all trains. I have discussed some of this here. 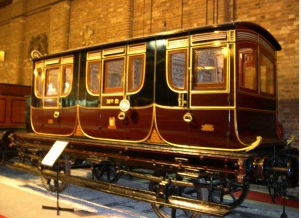 The first is an early royal carriage from the National Railway Museum. 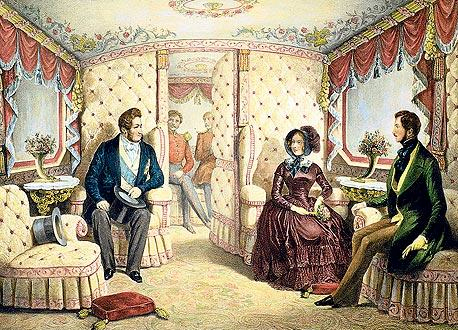 This drawing from 1844 illustrates the very sumptuous interiors of those early royal coaches. And here is an interior shot of the carriage shed at Wolverton where the Royal Train was housed and maintained when not in use. The shell of the building is still there on the embankment above Wolverton Park, but now this building has been converted into residential apartments. And finally, the National Railway Museum Blog has a posting about Wolverton’s royal carriage building here. The Watling Street, or the London to Chester road is well known and although bypasses have been engineered over the past 50 years the line of this ancient road can still be followed. It served in Saxons times to divide the manors of Calverton and Wolverton, as well as the manors of Loughton and Shenley further south and the river crossing was instrumental in the formation of Stony Stratford. But there are two other roads of significance that allowed travellers to cross the country from Oxford to Cambridge and to make pilgrimages to Walsingham in East Anglia. Both are ridgeways, that is they follow a line high above the valley. The northern ridgeway more-or-less follows the A422 past Buckingham and on the ridge to Old Stratford. From there, rather than ford the river, it goes to Cosgrove and Castlethorpe and along the high northern ridge down to a ford at Haversham. The southern ridgeway takes its line through Beachampton, through Calverton and crossing the Watling Street at Gib Lane, where there used to be a hanging tree (gibbet).This is at a point almost exactly 52 miles from London. This old track continued eastwards across the fields to reach Green Lane in Wolverton, which is now the only surviving part of this ancient road. Before the railway this tack was able to continue its line eastwards through Great Linford to reach Newport Pagnell. A third road appears in medieval times and was probably a consequence of the development of a market at Stony Stratford. This one could take you from Calverton to the south of Horsefair Green and crossing the road to Old Wolverton. This part of the road has now been lost, except for a few surviving footpaths. The original line was probably closer to Vicarage Road, across the meadows to the north of Wolverton House, closer to the Mill, across Wolverton Park where the old medieval village used to be, skirting to the north east of Holy Trinity and the old castle and joining the Old Wolverton road somewhere near the present location of the Galleon. The canal, of course, was not cut until 1800. The road was known as Portfield Way, indicating that it was a market road. The word port, from the Latin meaning a gate, was commonly used to describe a market – hence Newport, which in its day was a New Market. The presence of these roads had no small bearing upon the development of Stony Stratford and Wolverton. Road communications, rudimentary as they were up to the 18th century, were nonetheless used and brought trade and commerce to conveniently located settlements. These roads, together with the canal, were a factor in the decision to bring the railway works to Wolverton in 1838. The first official record of Stony Stratford comes as late as 1194. when it was given a charter (confirmed in 1199) to hold a market. See here. This alone would indicate that Stony Stratford had already reached a size of some importance, although the land on either side of the Watling Street was under the jurisdiction of the manors of Calverton and Wolverton. Dr Francis Hyde, in his History of Stony Stratford, is of the view that there was a settlement there in Domesday times. He infers this from the rather high assessment of Wolverton at £20 compared to much lower assessments for equally fertile land along the Ouse valley – Beachampton at £7, Thornton, Haversham and Stanton at £6. Calverton, even though heavily wooded in the Weald part of the manor is valued at £12. Hyde’s conclusion is that this relatively high valuation must include the economic life of inns and commerce along the old Roman road. I can’t disagree with this so the core of Stony Stratford must go back at least 1,000 years. The Romans believed in taking the direct route and they had sufficient confidence in their engineering ability to plan and build straight roads. The Ouse crossing at Stony Stratford is not the best fording point. It is at the centre of a loop in the river which is liable to flooding. The river can be much more easily forded at Calverton and Wolverton Mill. The only way the river can be successfully crossed at Stratford is by building a causeway. We know of a causeway in Medieval times but we can reasonably infer that such a causeway existed in the Roman period. The clue is surely in the name – stony, because stones were built up for a causeway and even laid on the river bed to allow a crossing. It is during the reign of King John that specific documents make their appearance with references to Stony Stratford, the first surviving one being in 1202 when a grant of land is made to Richard the Clerk from John de Calverton. Other references to property grants occur in the reign of Henry III and by the mid century there are sveral surviving grants in the papers of the de Wolverton family. Certainly by the middle of the thirteenth century a separate manor has emerged, possibly on the land known as The Mallets, according to a charter of 1257, and from this time forth Stony Stratford comes to be thought of as an entity, although the lords of Calverton and Wolverton continued to maintain a strong and active interest. 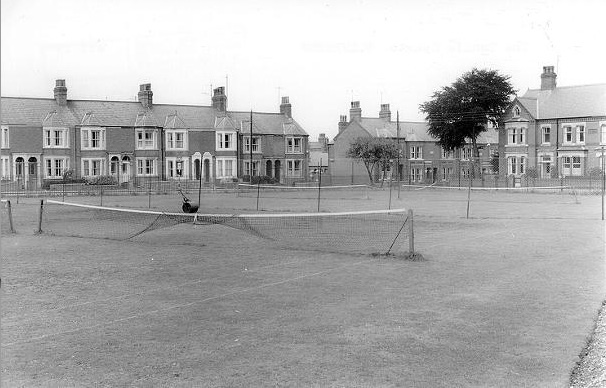 I have never played bowls, although I should be at an age when I could enjoy it, but I always admired the manicured bowling green in that square at the top of Cambridge Street. It is still there and I think the club house has little changed. There was also a bowling green in the Park which I suppose was equally popular. 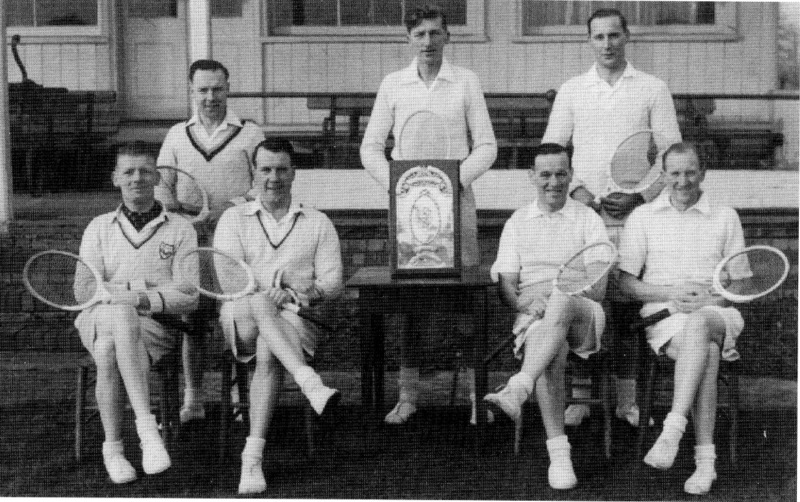 My grandfather was keen on the game in his later years and is pictured here in this photograph, the tall man standing on the left. 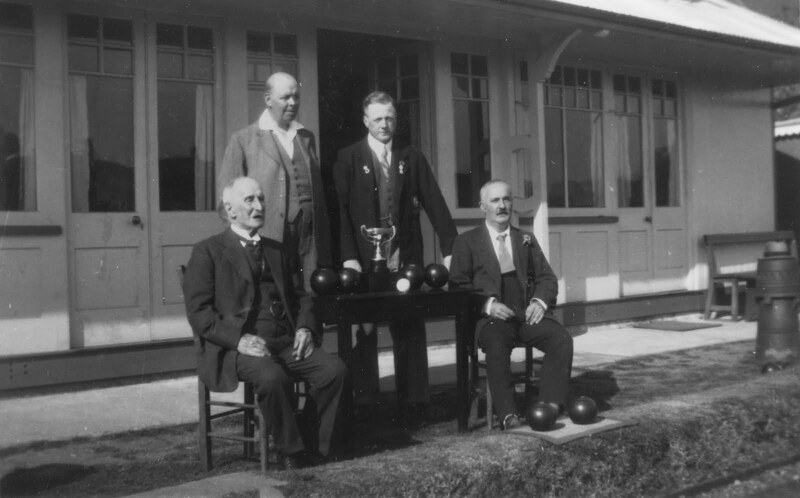 He was secretary of the Bowls Club at the time. I do not know the other gentlemen in the picture nor the occasion. Presumably some important trophy had been won. I would date the picture at around 1930. The acquisition of the Wolverton Estate from Sir Edward Longueville in 1713 by Dr John Radcliffe, a year before his death was a transformational event in the history of the Wolverton Manor. It was probably not intended to be. Radcliffe probably imagined that he had a few years left to play an active role in his new investment, but it was not to be. He died on 1 November 1714, possibly withgout ever having visited Wolverton. Radcliffe hadnever married and had no heirs, so he invested his fortune (which was considerable) in a trust which was to build a library and an infirmary at Oxford, amongst other projects. The income from the Wolverton estate – over £2,500 per annum and a significant income in those days – was to fund these projects. The early death of Radcliffe meant that almost from the outset of his ownership the manor was run by a committee. Over the centuries many eminent men filled the positions of trustees and they met periodically while handing over the running of the trust to a secretary. All of these men were distant from Wolverton and the man on the ground, as it were, was the land agent, who had the stewardship of Wolverton. Sir Edward Longueville had employed a man called Thomas Battison in this capacity, although Sir Edward, living in Wolverton, no doubt had a more hands on approach to control. Dr Radcliffe took on the services of Battison’s son John in this capacity.John Battison lived at Quinton. Battison was employed at a salary of £40 a year. Although Battison had the local knowledge and was probably effective when dealing with tenants he seemd to be a little out of his depth in dealing with the requirements of the trustees. Whereas he was previously able to make a verbal report to the likes of Sir Edward, the trustees required him (and they themselves were legally liable) to produce annual accounts. battison appeared to have difficulty with this an it took him until 1718 before he produced his first set of accounts. It also became apparent that many of the rents were in arrears and by 1720 these arrears amounted to £2,438 – over a full year’s income for the estate. Under pressure from the trustees these arrears were reduced in succeeding years, but the practice continued in greater or lesser degree. Nonetheless the trustees persisted with Battison for many years and it was only in 1739, when they became aware that Battison was letting some woodland and keeping it off the books, that they finally resolved to part company with him. He either resigned or was dismissed. He was succeeded by George Gill for the next nine years. Gill was probably not any more efficient that Battison in producing accounts on time but he appears to have been honest. During his tenure the great fire of Stony Stratford laid waste to a number of trust properties. ( A description here.) And in 1746 there was an outbreak of cattle distemper which caused a great loss in cattle stock. Gill died in 1749 and was succeeded by Joseph Stephenson who died four years later before he could make any impact on the estate. On March 27th 1754 the trustees appointed Thomas Quartley from Wicken as land agent and it appears that for the first time they had a man who could be relied upon to keep meticulous accounts and make annual reports. The rent books from his tenure still survive and are kept in the Bodleian archive. During his tenure there was a serious crop failure in 1757 which left some families in Wolverton and Stony Stratford destitute and starving – a reminder that 18th century society still had no mechanism for dealing with such emergencies. It was left to the vicar, Edmund Smith, to make the case and acordingly the trustees instructed the land agent to make payments to the vicar to provide bread for 139 poor persons on the manor. Quartley died in 1766 and was succeeded by Henry Smith of Bicester, somewhat remote from Wolverton. Nevertheless he seems to have managed the estate competently as his relatively short tenure appears to have passed without incident. Upon his death he was succeeded by Thomas Harrison in 1773. Harrison, as I have discussed elsewhere, brought an altogether higher standard of profesionalism to the task and, in fact, moved on to the estate, filling, in many personal respects, the ancient role of “Lord of the Manor”. It was this role, a traditional one in most villages, that was lost to Wolverton in 1713. Whether or not this was a good or bad thing depends upon your point of view. The trustees were remote figures, unknown to any except perhaps the tenants. The land agent was almost as detached until the arrival of Thomas Harrison who took a more direct interest in the estate. The long term impact was that Wolverton had no “gentry”living on the estate. There was a handful of middle class people in Stony Stratford and the vicar at Old Wolverton, together with a few farmers. This state of affairs continued into the 19th century with the creation of Wolverton Station. A host of artisans moved into the town to swell the populations of Wolverton and Stony Stratford and a few professional people came along with them. But entirely absent from Wolverton’s history after 1713 was the presence of any ancient privileged family. After 173 years heavy train traffic still thunders across the Ouse viaduct. It’s another triumph of Victorian engineering. 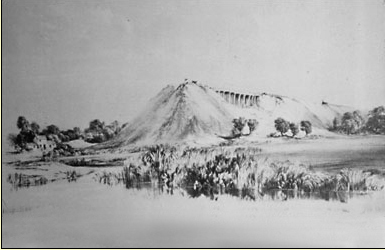 It is Wolverton’s most significant monument from the 19th century. The viaduct is 660 feet in length and rises 57 feet above the river and comprises 6 arches, each with a 60 feet span. The course of the railway line took it along a bend in the river but on the advice of an experienced surveyor, Bryan Donkin, and in discussion with the Radcliffe Trust, the course of the river was straightened and the embankment extended over the old course of the river. 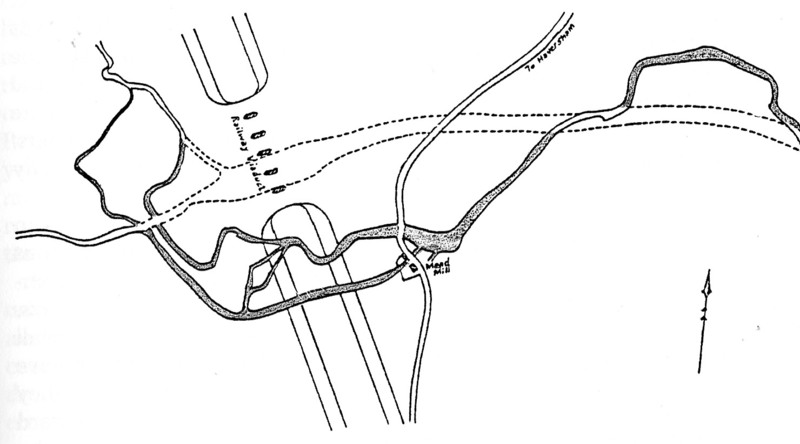 The shaded line represents the old course of the river and the dotted line shows the new, straighter course of the stream. One of the consequences of this was that Mead Mill, which is recorded in Domesday and had had a working life of 1,000 years, was taken out of commission. From 1838 only Wolverton Mill remained in service. Mead Mill was inhabited for a decade or so after this, but eventually the buildings were torn down and the site disappears from history. The new railway line split some of the farms on the eastern side and compensation had to be agreed and bridges built over the line, so negotiations were quite lengthy. However, an agreement was signed on 4th February 1835 and work began after the Act of Parliament on 3rd july 1835. The work took three years and was one of the last sections to be completed in time for the eventual opening of the railway line in September 1838. So for three years Wolverton had to deal with the experience of navvies. The term came from the canal building days of a generation earlier, when the labourers who dug the canals wer called navigators. This new army of labouring men were little different from their predecessors. they were a tough, hard working and rootless bunch of characters who were prone to splurging thier pay in the local fleshpots. Most of them were accommodated in shacks at Denbeigh Hall, but there were some wooden shacks at Wolverton and there is probably little doubt that these rowdies filled the inns of Stony Stratford on paydays. One can reflect that these huge embankments were built entirely by hand and shovel. There were no mechanical diggers or earth movers at this end of the 19th century. Some of this activity was recorded by the artist J C Bourne who left us two images of the work. The first here shows a land slip on the Wolverton side where the soil gave way as the problems of building on the old river bed had been underestimated. Once the got below the level of sand and gravel and blue clay, they came to a clay level that simply would not hold. Mixing the clay with more resilient material did not work and eventually they solved the problem by building five foot trenches on either side and filling them with coarser material to prevent any further spread. Incidentally, the buildings on the left hand side are probably Mead Mill. 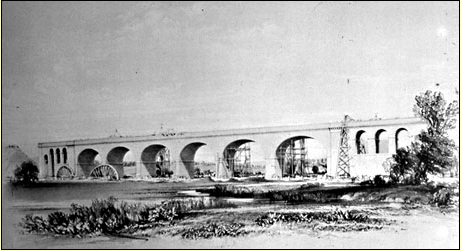 The second drawing shows the almost completed viaduct with some of the arch forms visible and some scaffolding still in place. South of the river there were still more serious problems. the contractors brought in huge quantities of slag and shale to fill the embankment and one night the whole embankment spontaneously combusted, producing a phenomenal sight for the villagers. This was caused by the iron sulphate decomposing in the embankment. 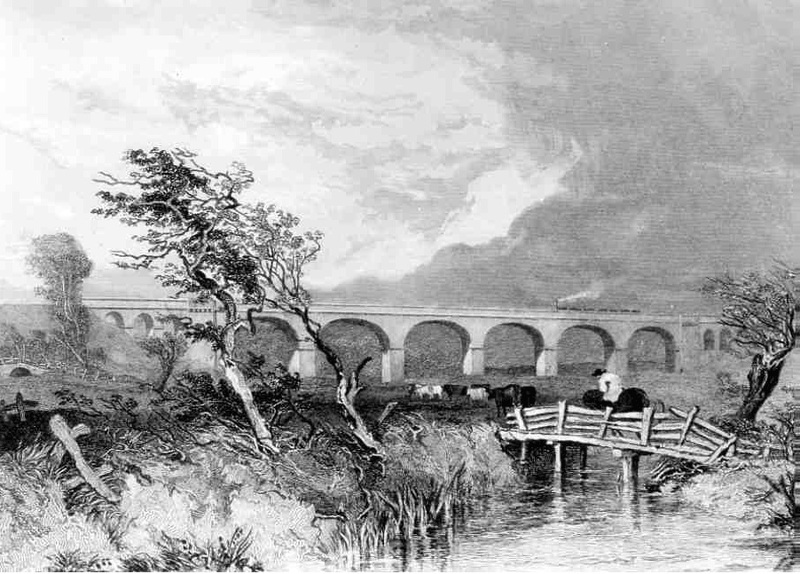 The Wolverton embankment and viaduct, along with the Kilsby Tunnel proved to be the most difficult engineering projects for the new railway. They were therefore the last to be completed and until September 1838, when the line officially opened, passengers had to alight at Denbigh Hall and travel by coach to Rugby. If you look at this map from the 1830s you can see a track leading north from Wolverton Mill. Apparently the track joined the Northampton road near Cosgrove in the 18th century and was used principally for traffic to and from the north to Wolverton Mill. In the middle of the 18th century the Mill tenants wanted to get the bridge rebuilt for horse traffic as it had collapsed some years before and they proposed this to the Radcliffe Trustees. The trustees saw no immediate problem with this but as soon as their intentions became known there was uproar in Cosgrove, the source of “great Quarrels and Heartburnings”. The tenants of the meadows north of the river had longish memories and recalled how this track had been used by drovers wishing to avoid the toll at Old Stratford, which had been introduced a few years before. Herds of cattle and horses driven across the meadows did not always keep to the track and much of the meadowland was trampled or churned up. It was a situation not dissimilar to some country roads today experiencing high volumes of traffic as a “cut through”. In this case the trustees listened to the concerns of the Cosgrove tenants and the new bridge was not built. Thomas Harrison had two surviving sons – John (b 1757) and Richard (b c 1760). Of the two, Richard became well-known in the annals of Wolverton but John was unknown. John and Richard were both executors to their father’s will, along with George, Earl Spencer. Circumstantial evidence would suggest that the Harrisons and the Spencers were close friends and it may be that the Spencer fortunes and those of the Harrisons were tied together. Sarah, Ducchess of Marlborough, and the wife of John Spencer Churchill, was one of the richest women in the country after the death of her husband. She settled much of her fortune on her grandson John Spencer, who after her death in 1744 found himself the possessor of large estates across the country and Holywell House in St Albans. It is in St Albans that we pick up the Harrison connection. John Harrison was an alderman in St Albans, as was George, Earl Spencer , and he was twice Mayor of the city, in 1789 and 1796. John married Irene Pearce from Chapel Brampton (also part of the Spencer landed interest) although there were no children from the marriage. His sister Jane also died in St Albans and it is a good guess that she was staying with her brother at the time. I don’t at this time know what John Harrison’s business was, but he was clearly one of St Alban’s leading citizens and therefore must have had good sources of income. He is one of the investors in the Buckingham Arm canal and also the Leighton Buzzard Brewery, where John Harrison is listed as a resident of Chelsea. John Harrison was also a director of the Royal Naval Hospital at Greenwich. He may have been in the Navy at one time but it is likely that he got this appointment through his association with Earl Spencer, who was Chief Secretary to the Navy. Richard Harrison is less shadowy because he remained at Wolverton and took over his father’s position with the Radcliffe Trust. He also continued to live at Wolverton House until his death in 1858. Apart from the business interests he shared with his brother he was also an investor in the ill-fated Stony Stratford Bank, which failed in 1820. Richard Harrison however had sufficient resources of his own to cover the considerable debts and was able to come out of the debacle without a stain on his character. During the latter half of his 40 year tenure he had to manage the considerable transformation brought about by the railways, and although there were tensions between the Railway Company and the Trust, as I have discussed elsewhere, Harrison appears to have managed his responsibilities well enough. At the time of his fathers will, Richard Harrison had been married to a woman called Agnes. This is all we know. Thomas Harrison had made a bequest to her, but she pre-deceased him by a few months and he amended his will. There appears to have been no issue to the marriage and this might have been the end of the Harrison line, but after 30 years as a widower Richard Harrison entered upon a second marriage to Grace Hall Nibbs, the daughter of a West Indian plantation owner. She was 30 years old. The remarkable part of this story is that she began to bear children to Richard Harrison in the 1840s – Spencer Richard 1842, Juliana 1843, Edith 1844, Isabella 1846, and Thomas in 1849. Richard Harrison was in his eighties at the time. Is this an error? Could this Richard Harrison be a son to the first Richard? Well that would be more plausible but Ivor Guest, historian of the Radcliffe Trust, gives Richard an age of 97 years. Spencer Harrison returned to Wolverton House in the 1870 with his own family and lived there with his mother until her death. Isabella Harrison married a German Baron and lived at Belvedere House, just south of Fenny Stratford. She unfortunately died of septicemia after the birth of her only child at the age of 27. The two Harrisons, Thomas and Richard, were central to the Wolverton estate for a long period, from 1773 to 1858, and their stewardship encompassed the greatest changes to Wolverton since the Norman Conquest, namely the coming of the canals and then the railways.